As Cannon’s highly-regarded reputation and people’s high demand on video quality, more and more people like Cannon video. At the same time, various problems to connect Canon VIXIA camcorder with Mac and to import VIXIA AVCHD/HDV video to iMovie/FCP/FCE/Avid/Adobe Premiere Pro/Kdenlive/After Effects, etc are emerging. Canon VIXIA Video Converter for Mac can resolve these problems easily, by converting Canon VIXIA AVCHD/HDV videos to Mac compatible video formats with only several clicks. It support most of the Canon VIXIA models. Most popular HD models of Canon VIXIA series, including the latest VIXIA HF S11, VIXIA HF S10, VIXIA HF S100, VIXIA HF20, VIXIA HF200, VIXIA HG21, VIXIA HG20, etc. 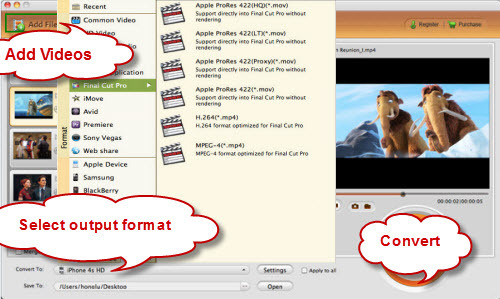 are supported by the Canon VIXIA video converter for Mac. 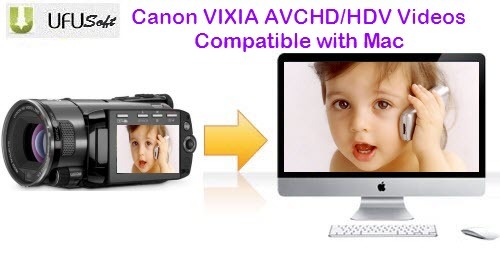 Aiming at playing and editing Canon videos on Mac OS X, first you should connect your Canon VIXIA camcorder to your Mac and import Canon AVCHD/HDV videos to your Mac, then do the following steps. Step 1. Add Canon VIXIA AVCHD/HDV videos to the program. Run AVCHD Converter for Mac from UFUSoft as the best Mac Canon VIXIA AVCHD/HDV to editing software Converter, and click the “Add Files” button to load .mxf videos. This Canon VIXIA Video Convetrer can convert AVCHD/HDV export lossless compression video/audio compatible with FCP/FCE/iMovie/Avid, etc on Mac. Step 2. Choose MOV with Apple ProRes 422 codec for FCP/FCE/iMovie/Avid, etc. Select the files in the filelist and click Merge, and the Mac Canon VIXIA Video Converter will join and combine the video clips into a single file as output. Step4. Convert Canon VIXIA AVCHD/HDV to ProRes 422 MOV for FCP/FCE/iMovie/Avid etc. Click the convert button under the preview window, the Mac VIXIA Video converter starts converting Canon VIXIA AVCHD/HDV videos to Apple ProRes 422 MOV, and joining the VIXIA files for editing on Mac. After converting and merging the Canon VIXIA AVCHD/HDV files, just import the output prores .mov or h.264 mov files to iMovie, FCE 4, Avid, Final Cut Pro, Adobe Premiere Pro, Kdenlive, After Effects, Adobe CS4 Master Collection, Adobe Encore, etc for editing. 1. Canon Vixia HG21, Canon Vixia HF S100, Canon HF100, Canon HD camcorder HG10 store their videos in AVCHD .mts files. And output videos of Vixia series are mainly MPEG4-AVC/H.264 video and they store videos as mts and other formats. 2. This Canon VIXIA video converter for Mac is also a good video editor for Mac, which provides powerful functions to edit your video files. You can trim video length, crop video area, set video brightness, contrast, and saturation, and customize video/audio output settings.